University of Zurich Welcome to the online home of Variations! The current issue of Variations is dedicated to the journal's 20-year anniversary. Welcome to the online home of Variations! 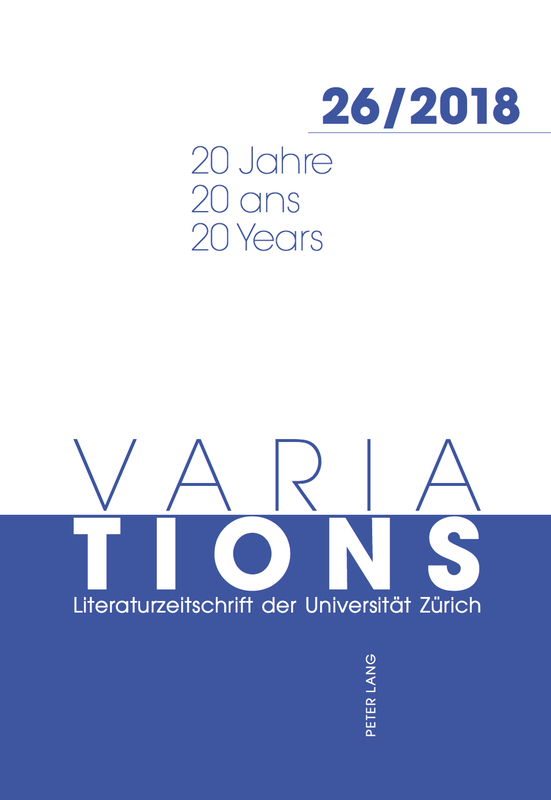 «VARIATIONS» is the comparative literary journal from the University of Zürich. It publishes articles in German, English and French and it serves as a forum for the university's students and faculty members working in the field of literary studies. Every issue publishes articles both on a chosen topic as well as contributions to current discussions in literary studies not connected to the topic of the issue. A third section contains literary and visual contributions. Furthermore, every issue closes with reviews of books recently published in the field of literary studies. Literature is a variation of that which it can never be: the variation of itself. It's theme is that it is not. Variation is movement. Movement is variation. Reading, if it succeeds, is a variation, not of the text, but of that which is varied by the text - and yet, for that reason, also of the text itself. Comparative literature: to read texts as variations.